Take our 2-minute quiz to find out if genetic testing makes sense for you and your family. If cancer runs in your family, an inherited gene mutation may be to blame, and you and your family may be at a much higher risk for cancer than the general population. Genetic testing is the only way to know for sure. 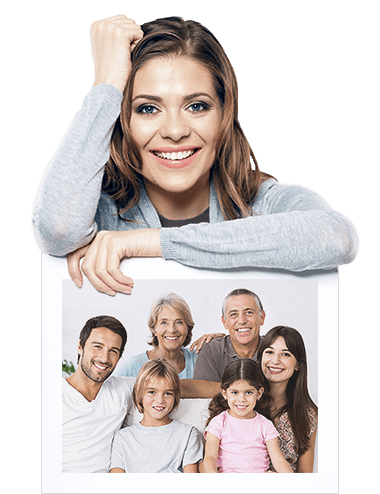 discover if genetic testing is right for them. This site and its survey/questionnaire are administered by 83bar, LLC (“83bar”) on behalf of the healthcare organization identified on this site (“Myriad”), for your health information and education purposes. By utilizing the site and agreeing to receive information, communications, and/or contact, as applicable, you are agreeing to this Data Use Policy and the terms below. As you navigate this site and communicate with us electronically, you may be asked to disclose certain health and personal information through surveys and/or questions, so that you may receive appropriate health-related services and informational materials. In order for you to make an informed decision about whether to disclose your health and personal information via this site, please review the following information about how we collect and use such information. Communications, and/or contact may include emails, text messages, phone calls and/or voicemails. At any time, you may choose to stop receiving communications by informing us via email, text or verbally via phone call. You may expect at least 1, and as many as 10 total automated text messages, unless additional messages are requested. Message & data rates may apply. Reply STOP to cancel future communications. Voicemails do not include personal health information shared by you via this site or by telephone unless such information has been requested. Delivering web-based information, products and services to you, including that which may be relevant or helpful based on your answers and feedback through surveys and questionnaires (you will always have the ability to “opt out” of any such communications or programs). To that extent your information is subject to HIPAA privacy and security standards (for example, if at a later time you choose to receive services from Myriad), disclosures of your information may also be made for HIPAA permitted purposes including the core health care functions of treatment, payment for care, and health care operations. HIPAA also permits information use and disclosure without the individual’s authorization for certain public policy and benefit purposes, such as in cases of emergencies, court orders/subpoenas, law enforcement purposes, or clinical research, with specific conditions and limitations applicable to such uses and disclosures. Your personal and health information will not be collected unless you provide it voluntarily through this site. In some cases where required by law or regulation, or if the information you provided has changed, you may update your information by sending us an e-mail or by updating your profile online where applicable. Under no circumstances shall 83bar or Myriad use your personal or health information to sell to third parties without your authorization, for marketing or sales programs that are completely unrelated to your healthcare interests or requests (as specified through this site), or for “junk mail” or SPAM purposes. Develop and show more relevant content to people who may be interested in the products, services or causes of Myriad . Serve relevant ads on platforms such as Google or Facebook. Limit the number of times that you see an ad so you don’t see the same ad over and over again. Measure the performance of ad campaigns across different browsers and devices used by the same person. Gain insights about the people who visit our website and/or view our digital materials. This Data Use Policy may be updated or revised periodically. When updates are made, the version date located at the bottom of this Policy will also be updated accordingly to reflect when revisions have been made. It is advisable to revisit this page and reread this Policy to see if any revisions may affect you. This Policy is not intended to, and does not, create any contractual or other legal rights in or on behalf of any party.